It is almost 18 years since he left us never to return. Leaders are born everywhere in the world and the services rendered by them for the good of their community are many. 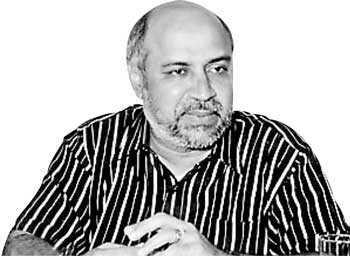 Although such services are remembered by the people now and them, not all their names would become historical as that of Late Leader and SLMC Founder Leader Minister Ashraff whose 18th year remembrance falls on 16 September 2018. Ashraff’s qualities of leadership and respect for bureaucracy developed loyalty and team spirit. Ashraff was a very kind hearted, sensitive and highly emotional personality always with a ready smile and kind word never failing to greet his staff, colleagues and his people. At the same time he was a leader who wanted things to be done correctly and was a stickler for correct details. Ashraff was a deeply religious man and would commence nothing without remembering the Almighty and seeking His guidance and blessings. He played a constructive role to install the former President Chandrika Bandaranayake Kumaratunga Government in a hung parliament. Ashraff became Minister. The late Leader Ashraff will be long-remembered by every citizen of this country as he strengthened the hands of the former President in her efforts of finding a meaningful solution to the ethnic conflict. Ashraff saw as nobody did before him the political potential of the Eastern Province with its predominant Muslim habitation. Before his advent Muslim politicians aligned themselves to the two major political parties – the UNP and the SLFP. He was no doubt permitted by the waves of radicalism then sweeping across the Islamic world and the growing power of the Arab States. Late M.H.M. 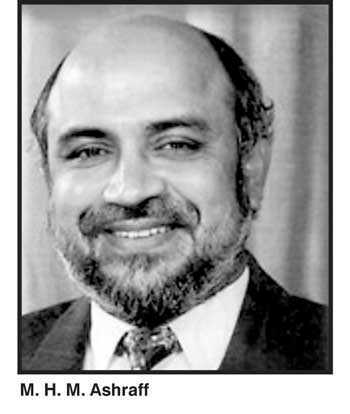 Ashraff, LLM PC, one-time Cabinet Minister of Ports, Shipping Rehabilitation and Reconstruction, Member of Parliament and Sri Lanka Muslim Congress and National Unity Alliance Founder Leader, died on September 2000 while on his way to native Ampara district in a Sri Lanka Air Force helicopter which crashed in a blaze of flames in Aranayake. It is almost 18 years since he left us never to return. He was a great and worthy son of the Eastern Province and was born in Sammanthurai. He was indeed not born with the proverbial silver spoon but at the time of his untimely death he had established himself as a silver lining in the political establishment of this country. He was the only son of Mohamed Hussain, a highly respected village headman and Matheena Ummah whom he loved dearly. Being a son of the Eastern soil he had his primary education at Kalmunai Wesley High School and thus in his formative years developed a very strong bond with the Tamils, and had to leave his home region to pursue further studies at the metropolis. In 1970 he joined Law College where he excelled and manifested prowess in the field of Constitutional Law by writing the first book on Constitutional Law in Tamil with particular reference to 1972 Republican Constitution of Sri Lanka. At Ceylon Law College, the natural nursery to many a political leader, he was president of the Law Students Muslim Majlis and of the Tamil Mantram. He was an influential member of the student community, nearly missing the coveted position of President of the Law Students’ Union. In 1974 he joined the Attorney-General Department as a State Counsel and worked there to get himself acquainted with the law to become an eminent lawyer. He practiced in Kalmunai and Batticaloa. He completed the Master’s Degree in Law prior to becoming a senior minister. He was honoured with title President’s Counsel. Particularly in the Eastern Province Ashraff gave them what no other leader has given them in such a short period of time. Late Ashraff, was first and foremost a very humane person, but he had a strong will and a justice which spurred him to give his people their just in the political, social and economic firmament. The Late Minister Ashraff entered Parliament in 1989; he formed Sri Lanka Muslim Congress. As leader of the party he extended his cooperation to the Late President R. Premadasa, though he was in the opposition. He maintained a cordial relationship with the President to win back the rights of the Muslim community. Ashraff never tolerated the injustices and discrimination meted out to minorities. His dedicated efforts have transformed his home district of Ampara from a backward rural district in to a fairly developed area moving rapidly towards modernism. His single handed dedication to establish the South Eastern University will be recorded in letters of gold. His content struggle to obtain the rights of the Muslim people had much success during the last six years. He had a vast following among the Muslim people who appreciated his vision, the immense sacrifices he made for their cause and his sincerity of purpose. A good administrator should be a good human being. Despite all the knowledge and techniques of administration and management one cannot be a good administrator unless one has good qualities coupled with attractive talents in ample measure. He did not cultivate these qualities but they were part of his nature. His experience in the political field enriched his administrative acumen and came in handy. The Eastern Province saw development through Late Leader M.H.M. Ashraff in a short period of six years. Ashraff did yeoman services to elevate the Colombo Port as one of the best in Asia. He rapidly started the reforms in the harbour once he took charge of the Ministry. The Minister established a marine training institution at Oluvil and planned to construct a harbour too. His gift of a light house at Oluvil majestically stands giving a ray of home to the unemployed youth of the region. No Muslim leader will be cherished and remembered like Ashraff because of his achievement of South East University. Ferial Ashraff, former Minister of Housing Construction was always in the background. Then suddenly with his tragic death she was pushed in to that same arena of politics; now she has retired from politics. Aman Ashraff is their only son; he tries to follow his father’s footsteps. ‘Was Ashaff a dominant figure as a politician or as a poet? One who see the harmonious and soothing effect of the rays of the moon; the kisses of the trees; the whispering of the stars; when he decided on this poem, he made my father the pen and my beloved mother his parchment’. May Allah bless him with Jennathul Firdhouse, Ameen.